Huge Savings! 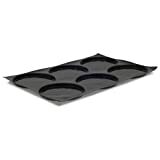 Up to 17% off on Muffin & Cupcake Pans at Just Gathering. Top brands include Focus Foodservice, Sasa Demarle, Magna Industries, Carlisle, Demarle, Polmedia Polish Pottery, Euro-Home, Amco Advanced Performance, & Pampered Chef. Hurry! Limited time offers. Offers valid only while supplies last.